The title is a giveaway. “Mélo.” Melodrama. And the 1986 film of the late Alain Resnais is, beyond all else, melodramatic, resorting to, in no particular order, an affair, poison and suicide. That it never feels outlandish can likely be traced to its roots on the stage. The film is based quite specifically on Henry Bernstein’s 1929 play, and I say quite specifically because Bernstein himself is given the sole writing credit. Often plays adapted for the screen fall prey to the fallback criticism of “it was too stagy.” But Resnais seems intent on making his silver screen version of “Mélo” too stagy. He pours the intimacy on thick, pinning us down in very limited locales. Even during a trip to a dance club, the camera conspicuously stays attached to the characters at the table, as if the dancers and the dance floor and the dee jay are merely hypothetical. It’s like a stylistic exercise to remove the style and show that even the static can be dynamic. The opening sequence, which seems to speed by in the bite of a desert streudel but actually takes up close to a quarter of the film, makes everything seem too good to be true. 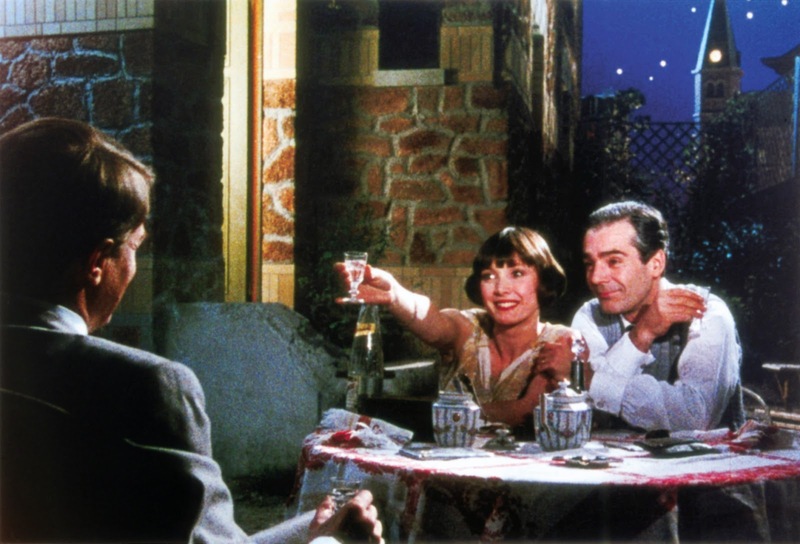 Not just in its setting, a picturesque French courtyard out back of Pierre (Pierre Arditi) and Romaine’s (Sabine Azéma) home, the moon looming in the nighttime sky, but in the way this married couple interacts with their violinist friend, Marcel (André Dussollier). Still, hints are dropped that not all is as it seems, particularly when the subject of children is broached. It seems Romaine wanted them and Pierre did not. They remain civil, mostly, but it tips the film’s hand. Then, it drops a bomb. It is a breathtaking monologue, upwards of ten minutes, the camera seeking out Marcel above all else as he proceeds to tell the story that both defines his existence and will work to define “Mélo.” itself. At a public performance he was forced to watch from the stage as the woman he loved carried on in the audience with another man. Still, he played on, sumptuously, maintaining performance even in the face of this unspeakable event that shattered for him the illusion of love. Such faithlessness, such betrayal, he could not and cannot abide. Ah, but what if Marcel is made to be the betrayer? Well, that’s the only way this can go, of course, and it will. Romaine schemes her way into Marcel’s life and makes eyes at him, which he rejects until he almost instantly re-considers. She seems spurred less by attraction than growing disinterest in her husband and a fun-filled self-destructive impulse. He seems less spurred by attraction than a psychological craving to know what it would have been like to be that man in the audience with his wife. It is just about the most miserable love affair ever. So miserable, in fact, that Romaine decides to compound her misery by poisoning Pierre. Why she wants to do this is never made specifically clear but then it never quite seems clear to her. This is the traditional descent into madness. She cannot abide her own faithlessness. The cramped confines of her and Pierre’s living quarters (and juxtaposed against Marcel’s much more swanky digs) lends tangibility to her climbing the walls, and her fate is met in perhaps the film’s most sublime moment – a walk alongside a river, at which point Romaine and the water and their surroundings all just sort of merge in the shot, like a van Gogh, and then give way. Gone. That leaves one more confrontation, Pierre seeking out Marcel, hoping to find out what happened, and Marcel essentially coming face-to-face within himself – that same man who delivered that same monologue seemingly so long ago is now Pierre. Thus, Resnais’s play-like approach here and all its claustrophobia renders “Mélo” as a French funhouse of mirrors where no one can escape his or her reflection.